How do you find the love of your life when you cannot see? This short documentary film by Jenny van den Broeke attempts to answer this question with the help of three blind teenagers: Florian, Merel and Ilse. Their love lives as well as their ideas of what love should be like differ quite a bit. The three teens give us a peek into a world void of visual stimulation. Together they show us how it is to be young and in love and how their life is being affected by their blindness, especially in matters of love. The stories are intertwined in such a way that we get a feel of how blind people of their generation live. In Blind Love we do more than just observe Ilse, Merel en Florian. The documentary draws us into the world of the blind by playing with our visual language. We experience love through the eyes of the teens by means of animation and ‘Braille’-like ‘finger tip’ camera work. By leaving out information or by distorting the picture, we are being challenged to distill an image out of very limited information. In some cases we have to rely almost entirely on our memory of sounds to make sense of a situation. Just like a blind person would. Our three teens have strong positive personalities. Blind Love invites you into a warm, loving experience and shows you the strong, positive characters of these young people. As a result the film is upbeat and lighthearted. The love, sometimes exciting and fresh, is palpable throughout the film. We experience it as a pink cloud or a warm bath. This, however, does not obscure the obstacles that blindness causes, struggles abound, but love remains the active verb. The lives Florian, Merel en Ilse lead, differ quite a lot. In matters of love, they too make distinctly different choices. Each story has its own dramatic development and illustrates a different phase in a relationship. Florian’s sighted girlfriend Tara is graduating from high school. She wants to move out of town, while Florian has to stay in school for another year. Will their relationship survive this separation? After nearly eight months of just speaking on Skype, Merel is going to meet her Danish boyfriend for the very first time. Ilse is still looking for her proverbial ‘Prince on the white horse’, but she has a very clear idea of what he should look like. In the mean time she is fully enjoying her other love: ‘Goal Ball’, a sport invented specifically for blind people. Each of these stories is in part told through animation. At those moments we experience the world from the perspective of either Ilse, Florian or Merel. Their stories form the basis for the design. 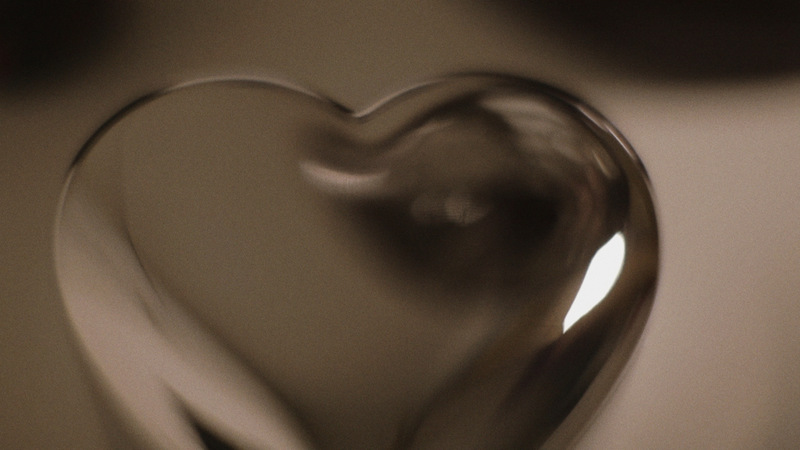 Florian’s love for computers, for example, is merged with his love for Tara into a computer generated world constructed out of spheres in which we observe the contact between two human shapes. Merel’s animation is classically drawn by pencil on paper. Her real world is based on tactile impressions. The visible structure of the paper symbolizes this tactility. White space symbolizes the emptiness in her head that surrounds the appearing image of her new boyfriend. Because she has not yet met and ‘felt’ him in the flesh, she is unable to fill in these blanks. Out of the three, Ilse is most visually oriented. Until recently she was able to distinguish vague outlines and colors of objects. Because of this she was able to build a visual memory to which she relates new input. As a result, the design of her animation is more realistic, even though the image is already starting to fade.